The global finance system can be regulated to prevent massive credit fraud, tame capitalism, confront the sovereign debt crisis, and move towards investing in the real economy and full employment. "Obamanomics", and American reinvention can lead to a sustained economic recovery but only together with major domestic, European, and global monetary reforms in cooperation with emerging nations. For decades, the U.S. dollar has served as the world's reserve currency. But after the global market meltdown and the resulting massive stimulus spending meant to keep the Great Recession from becoming an even Greater Depression, confidence in America's ability to make good on its growing debt is at all-time lows. In Brave New World Economy: Global Finance Threatens Our Future, Wilhelm Hankel and Robert Isaak—two extremely controversial, yet highly respected experts on international economics and management—describe how "Obamanomics," the Euro crisis, and shift of economic growth from the West to emerging economies, if handled properly, can lead to true economic stability and job creation. How we arrived at this economic crossroads isn't as important as the decision as to which path to take. The Brave New World Economy points us in the right direction. Wilhelm Hankel is former Director of the German Economic Finance Ministry, Department of Money and Credit. An internationaleconomist and consultant to centralbanks, his creative theories of money and the global economy, as well as his proven fixesfor stalemated political economies, are illustrated throughout fourteen books. Robert Isaak is a political economist and the Henry George Professor of International Management at Pace University, in New York. A consultant to businesses such as Siemens and Prudential Intercultural, he has taught at Johns Hopkins SAIS, and New York University, and has been a guest professor of international management at the University of Mannheim, Heidelberg University, the University of Grenoble, and SKEMA Business School, in France. He has authored eleven books on political economy. Rescue the Right to Work in Aging Societies. Defuse the Ticking Time Bombs of the Welfare State. Enroll 100 Percent of the Population in Pensions. Look for New Answers to Old Problems. Subsidize Start-Ups in Disadvantaged Regions. The Mandate of the Democratic, Constitutional Welfare State: Stability, Reliability, Prosperity. Chapter 1 Midas Reveals How to Create Money through Credit Fraud. Does Progress in Developing Money Equal Progress in the World Economy? The State as Accomplice or Controller of the Money Economy, or Both? The Illusory World of Finance and the Fictional Capital of Banks. Will Yesterday’s Recipes Help Us Today? The Finance Sector Always Underestimates the Risks of Its Innovations. Four Fatal Innovations of Global Banking. Four Conclusions from the Financial Crisis. Chapter 2 The Great Bluff: The American Way out of the Crisis. A Brief Tour of How We Got Here. How American Globalization Revolutionized Finance. Wanted: An Emperor with Clothes. How Goldman Sachs Milked Bubble Trouble. Origins of the Financial Crisis. The Lost Lessons of Long-Term Capital Management. The Government Intervenes; Investors Panic. Obamanomics: Exploiting Crisis, Postponing Costs. The Debt Culture versus Hoarding and Investing. Austerity versus Stimulus: The Trillion-Dollar Gap. Recasting the United States: Domestic Dynamism with Responsibility. Chapter 3 Giant with Feet of Clay: The European Union. What Services Has the EU Rendered? The Euro: Not Dynamic but Dynamite. Is the European Union on Its Way to Becoming a Nation-State? Do EU Institutions Induce Constitutional Infidelity? The Three Unknowns of the Current Bailout of the Euro. The Next Financial Adventure: A European State Bankruptcy Law. The Future of the EU: The Swiss Model. Currency "Concubinage": The Currency Has to Serve the Citizen, Not the Citizen the Currency. Chapter 4 The New New World: Can BRICs Save the Rich? The Rise of the BRICs. Characteristics of the New New World. One BRIC at a Time. Debt versus Investment and Savings in BRICs. The Group of 20 and Global Imbalances. The Roadmap to the New World Economy Has Changed. Chapter 5 Time for a New Bretton Woods: Crisis Prevention through Monetary Law. What Caused Bretton Woods to Fail? "Floating"Exchange Rates: A Compelling End? Living in the "Nonsystem"of Post–Bretton Woods. Keynes with a New Feature: Real (Not Nominal) Fixed Exchange Rates. 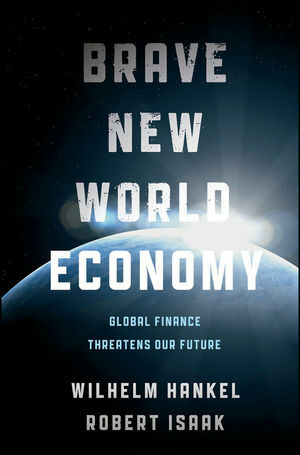 Chapter 6 Toward a Brave New World Economy: Reducing Debt and Unemployment. The World Economy and Nation: States Are a System of Communicating Pipes. Democracy Begins and Works at Home. Pillars of Stability and Self-Healing Therapies of Modern Society. From "Underground"Work to Lifelong "Retooling". The Dilemma of the Overindebted State. The Three Megatrends of the Global Economy of Tomorrow. Epilogue Faust and Mephisto on the World-Money Stage. From Paper Gold to Paper Paper. The Narrow Middle Lane of Successful Capitalism. From Gold to the G-20.